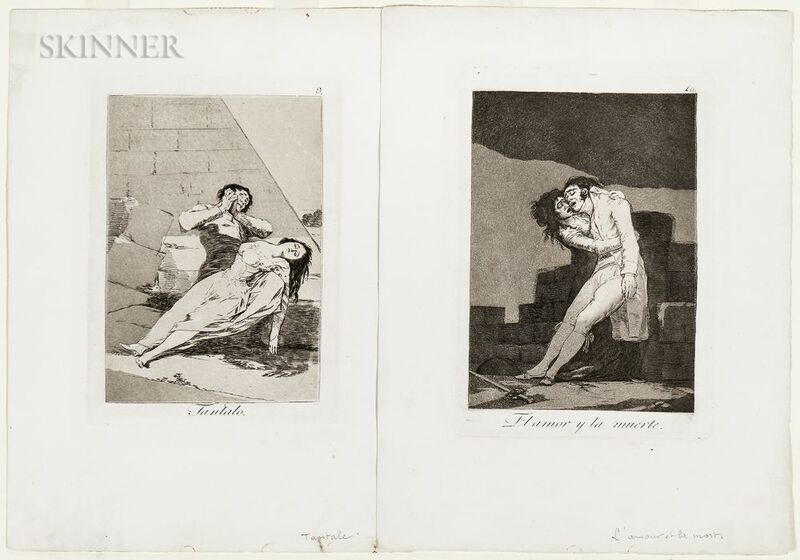 Two Plates from Los Caprichos, 1799; Tantalo, plate 9 (Harris, 44iii/iii) and El amor y la muerte, plate 10 (Harris, 45iii/iii), both from the third edition of twelve. Both unsigned and with the title and plate number within the plate. Etchings with aquatint on white wove paper, plate sizes 8 1/2 x 5 7/8 in. (21.4 x 14.7 cm), matted, unframed. Condition: Deckled edges, minor staining (including possible oxidation stains from tack heads) along some edges, pencil annotations to lower margins and versos.